Established in 2003, Melbourne-based architectural firm studio505 under the inspired guidance of directors Dylan Brady and Dirk Zimmermann are credited with some of the most innovative and imaginative architectural projects launched in recent years, most notably the award-wining 6-star Greenstar Carbon Neutral Pixel building and their distinctive design for the 22,000m2 metal façade screen of Suzhou’s Science and Cultural Arts Centre (SSCAC). 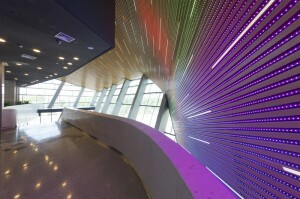 Completed in 2009 and awarded a previously unheard of perfect score of 105/105 in the Australian Green Building Council’s Green star rating, the Pixel building was also certified as Australia’s first carbon neutral project, which also took out the LEED top rating award and remains the world’s highest rated LEED building. Previously featured in PRC Issue #59 in April 2012,accolades received in relation to the Pixel building have led to numerous sustainability awards for other Studio505 designed structures and technology transfers for the entire design and construction team. Completing the Pixel building set studio505 on a fast track to global recognition and it subsequently being featured on the cover of the highly respected USAGreen Source Journal, something of a coup for a young architectural firm from Downunder. 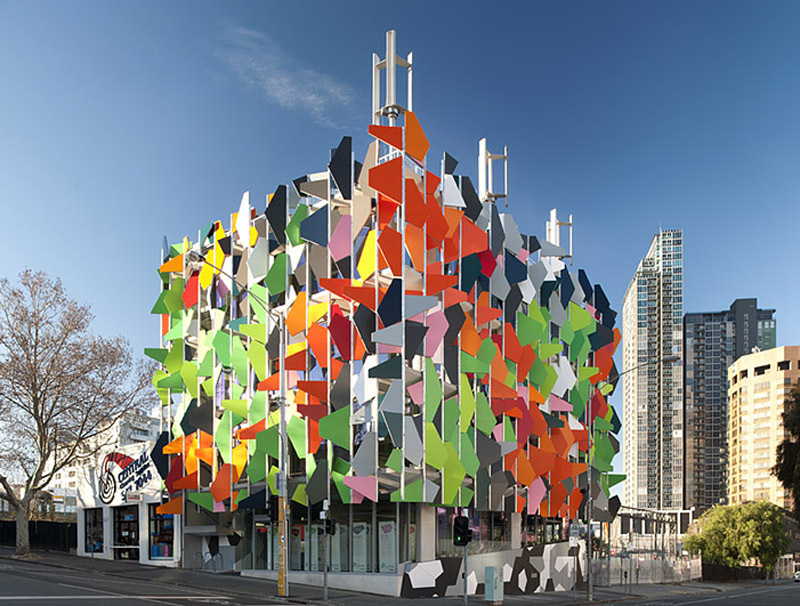 The distinctive design of the Pixel building has also contributed to development of the firm’s subsequent innovative work and its high quality contribution to the urban fabric and culture of the communities in which their projects are located. studio505 has developed a definitive skill and imagination in artistically fusing architecture and art, particularly in the field of facades. 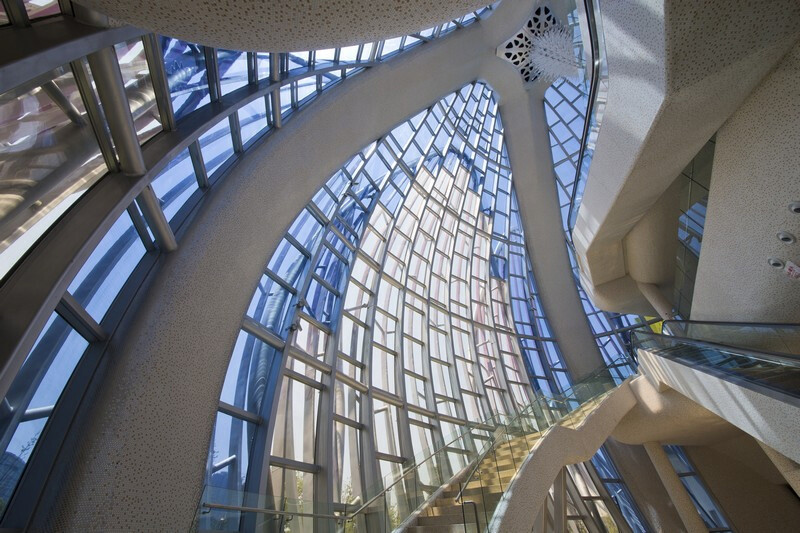 They have coined the term art-facades for this aspect of their work, as is effectively represented in the award winning façade for the Wintergarden shopping centre in Brisbane, Australia. This fantasy canvas of a led lit, colour soaked, laser cut and hand folded garden wonderland with massive sculptural butterflies straddles three street frontages of the city centre precinct, creating a landmark, a brand and an artwork all at the same time. The client, a major institutional retail funds manager, has since commissioned the practice to deliver two other unique façade projects in their retail portfolio – reinforcing the ultimate accolade for architects – repeat customers. In 2009, studio505 was invited to enter two major design competitions – one for a new cultural complex and grand theatre in Wujin, Changzhou, China, and the other in Singapore – a new 1000-bed hospital complex. For the new ward tower design of the Ng Teng Fong GeneralHospital in Singapore, won through an international design competition in collaboration with CPG and HOK, studio505 imagined a radical, simple and profound new way to think about the naturally ventilated multi-bed wards. The principle of giving every patient a window generated the entire plan form of the ward towers, including garden beds, natural ventilation, shading and adjacency relationships that have created a truly unique and improved spatial condition for a healing environment. 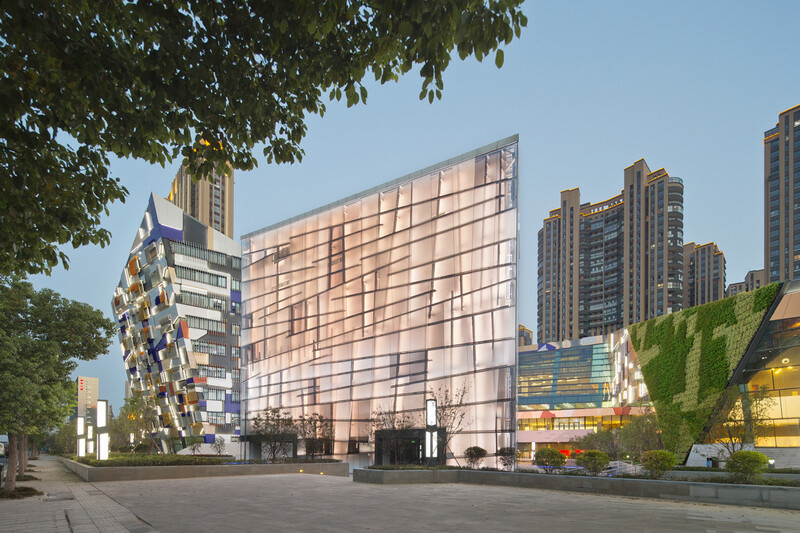 The studio subsequently won the Wujin competition for the architecture, interiors, landscape design and façade detailing for the now completed Phoenix Valley project, a 65,000m2 cultural precinct that houses the Wujin Grand Theatre (shortlisted in the 2013 WAF INSIDE Culture award to be announced this October), four cinemas, an art gallery, retail spaces, a sports and dance complex, as well as a youth palace for 4,000 students. The total PhoenixValley project has also recently been shortlisted in the prestigious Chinese LuBan prize. It has also been certified under China’s 3-star rating due to its use of passive and active technologies originally developed and applied on the Pixel building, including a patterned, planted green roof, an expansive BIPV installation, natural ventilation and extensive water cycling and re-cycling systems. PhoenixValley is a network of functions arranged around a central valley. It is a geological building – a grass-covered mountain carved deep to its base by the canal aimed at its heart and revealing the glowing glass jewel of the art gallery. Green roofs cascade into green walls, which are planted in flowering patterns that stitch into the façade. The façade is a patterned composition of gold and stone at the theatre, transforming to silver and colour at the youth palace, and creating a distinct brand and image that the building and precinct can claim as their own. 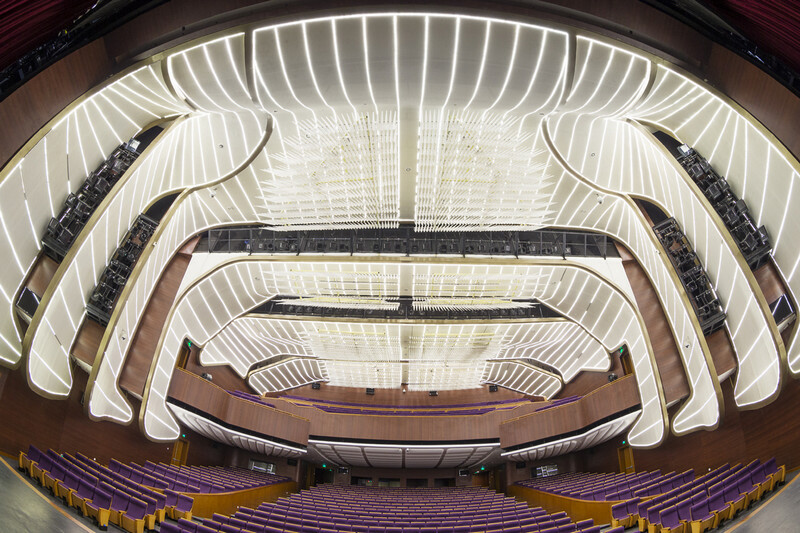 Wujin Grand Theatre takes its design cues from the symbolic logic and form of the carapace of the cicada. In China, the cicada is a symbol of longevity, or rebirth and eternal life. The design team have connected this idea with the rebirth and creation of new worlds that occur every time the magic of theatre or opera is entered into. The interior form and design is based on the interlocking shells wings and antenna of origami bugs, with lapping translucent acoustic and visual baffles lines in contoured LEDs forming a fluid and panelised skin. The chandelier to the ceiling is based on the micro structure of the antennae of a moth and its soft pulsing LEDs create a living and fluid carpet on the ceiling, pulsing with the slow heartbeat that a massive insect-like form would have. Wujin Grand Theatre promises to be a venue that can create and recreate unique spaces for the imagination. With the capacity to project and extend the theatrical set and activity out into the auditorium, it is also possible to project architecture onto the walls, rendering the internal space as a simulacrum of anything that can be created in a computer model, and extending the tools of the theatre designer into a new realm. Just across the road, the Wujin Planning and Exhibition hall is completely different to its neighbour, but no less impressive. 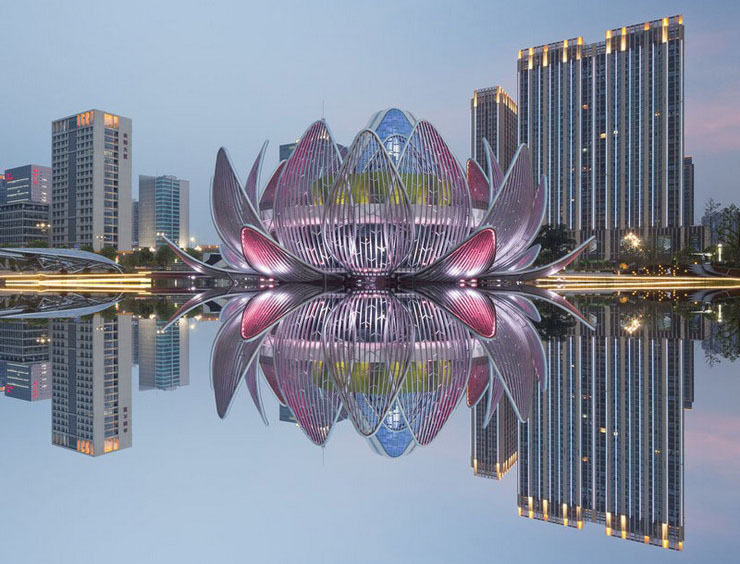 It is a 35m high series of 3 lotus flowers filled with exhibition spaces and meeting rooms, floating on a 10,000m2 lake in a landscaped garden of mosaic bowls, flowers and patterns. The building was conceived as an occupied sculpture. The night lighting, the reflections, the park setting and its magical otherworldliness makes it a landmark that draws cameras out of the bags of locals and tourists alike. The lake itself inspired the lotus – a flower floating on a lake – represented in three blooms; the young closed bud, the full flower and the opened flower with the seed pod inside. There is no door to the lotus, it is not entered from the outside at all, but rather seen in the round, mirrored in the enlarged lake that surrounds it. Entrance is from beneath the lake, and inside the majesty of the central flower pod is revealed – a soaring 10storey circulation volume with an eternally blue sky inside. The entire solid surface of the lotus is mosaic tiled, smoothly running from stainless steel tiled edges to the continuous speckled white interior. The gardens, the landscapes and flower-based geometries explored in these projects In Wujin also informed the process of design of the Waratah Studio – shortlisted in this year’s WAF awards. The sculptural studio played a key role in winning the ‘Best in Show’ award for the AustralianGarden designed by Philip Johnson Landscapes together with Fleming Nurseries at the 100th Chelsea Flower and Garden Show in the United Kingdom – a horticultural Olympic Games. 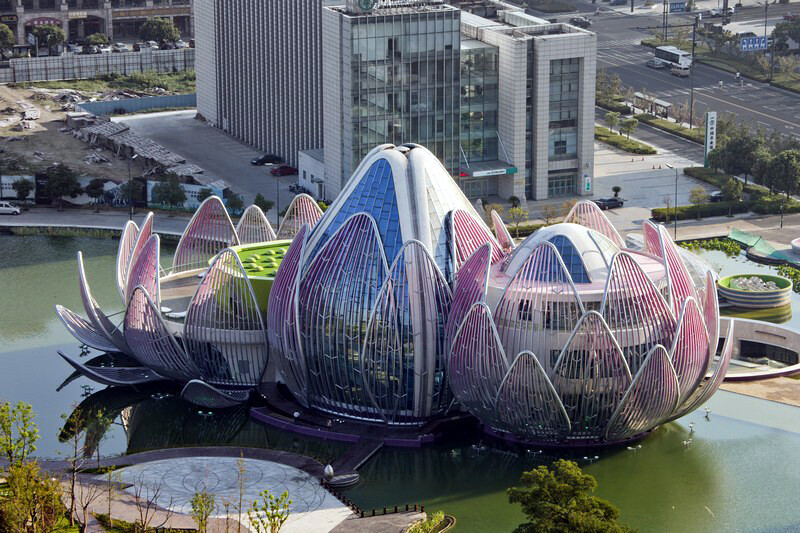 The sculptural form of the studio has subsequently been repeated in the VictorianGarden at the Chinese National Flower Show 2013 in Wujin. studio505 commit thought, energy and intelligence to each project. Currently, they are completing the detailed design for a schooling academy Malacca and new hospital in Sabah, Malaysia, and are working on some extravagant new retail and resort projects in China, as well as a new residential apartment tower in Melbourne. Some of these projects, we are also reliably informed, are once again based on flowers.